"Pour the wine into empty ice cube trays. 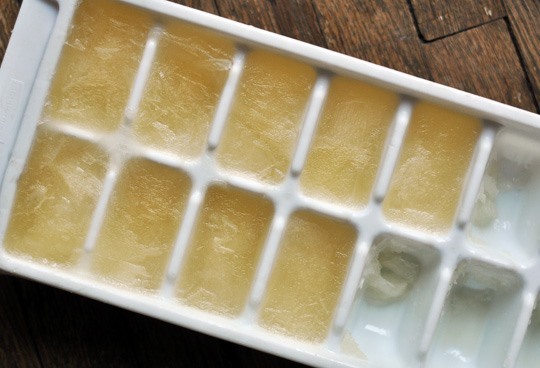 You will need about 2 standard-sized ice cube trays. (Each cube portion is about 1 ounce.) Freeze the wine overnight, or for at least 6 hours. 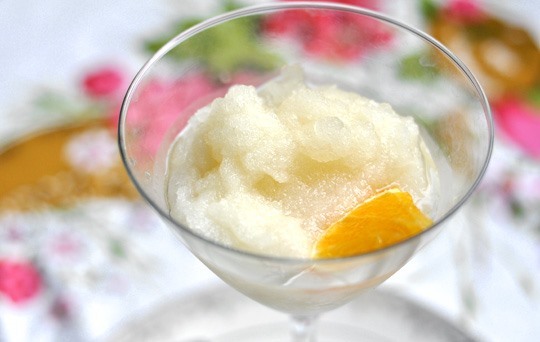 Scrape the slush into a martini glass, garnish with a piece of fruit, and serve immediately. Repeat for each serving." Less-alcoholic variation: "If you would like a less alcoholic treat, replace several cube portions in each tray with orange juice, white grape juice, or a mixture of the two. For each serving, replace 1 cube of wine with juice. You can also do the same with ice. This will dilute the flavor, but will make each serving lighter and a little more of a palate cleanser." Previously, HowTo: Spike Your Popsicles. The Hopsicle is a Beer Push Pop.